The Coalition for Economic Survival (CES), one of Los Angeles’ leading tenants’ rights organization, has been highly critical of the field of candidates running for Mayor and City Council in the March 5, 2013 elections. CES’ bone of contention with the candidates is based on their failure to clearly state what they would do, if elected, to ensure tenants’ rights, protect the City’s Rent Stabilization Ordinance and preserve rent controlled and government assisted affordable housing from being demolished and converted to luxury housing. The Crowd at the Debate. 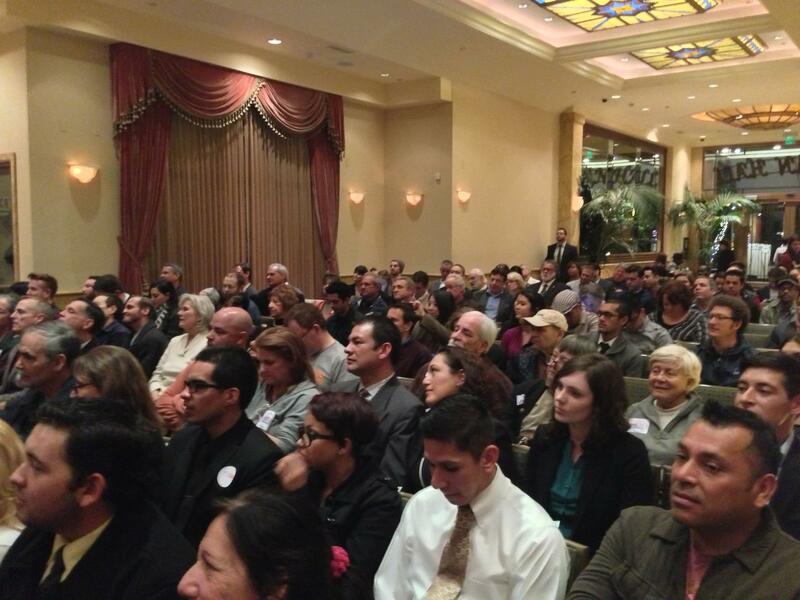 It was with these concerns that we headed out to a debate between candidates running for the 13th LA City Council District on January 24, sponsored by the Hollywood Chamber of Commerce and the Hollywood Chamber Political Action Committee. Given the sponsor, one would rightly think that issues affecting renters and working people would not be a priority for discussion at such a pro-business forum. It was exactly why we were interested in attending. You get a better picture of who a candidate is by what he or she promises the group they are speaking to and seeking support from. Sadly, the panel of candidates at the packed Taglyan Cultural Complex on Vine Street in the heart of Hollywood did not include women. Well, except for former 13th District Council Member and Assembly Member Jackie Goldberg, but she was there to moderate the debate. 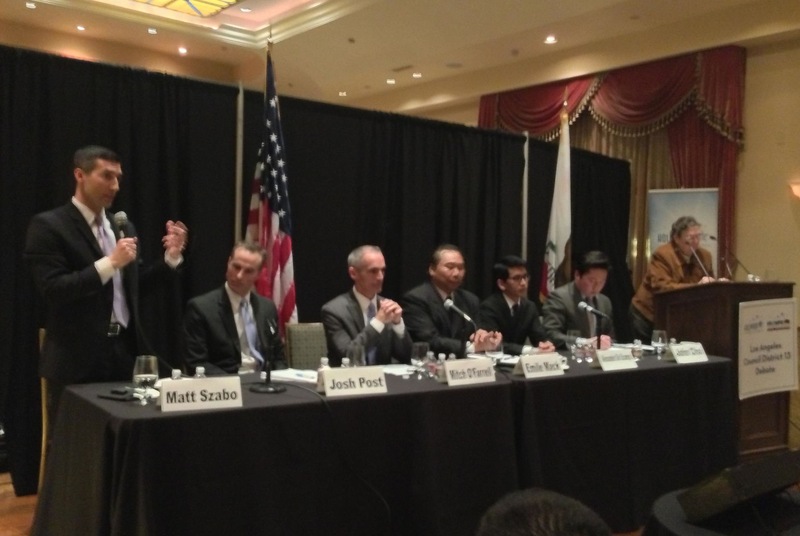 The six candidates participating were John Choi, a former staff member of the Los Angeles County Federation of Labor, Alex De Ocampo, Senior Director of Saban Family Foundation, Emile Mack, LAFD Assistant Fire Chief, Mitch O’Farrell, Former District Field Director to Councilman Eric Garcetti, Josh Post, State Deputy Attorney General, and Matt Szabo, Former Deputy Chief of Staff for Mayor Villaraigosa. Many candidates appeared to be pandering to the pro-business crowd with commitments to ensure public safety, fund the fire and police departments, provide tax credits to the movie industry, provide tax breaks to small businesses, doing away with the city’s gross receipt tax and curbing the “aggressiveness” of Superman, Darth Vader, Wonder Woman and the other costumed characters on Hollywood Bl. with many of the candidates stating that their behavior threatens tourism. The candidates were non-distinguishable for most of the discussion. 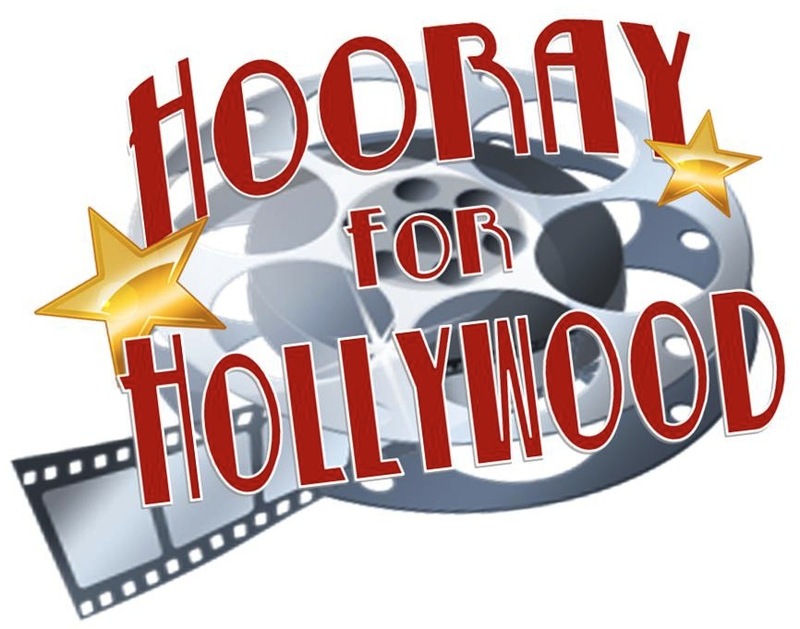 But, then the questio n was raised if they supported the Hollywood Community Plan recently approved by the City Council. Each of the candidates uniformity expressed support for the Hollywood Plan, but one candidate added something that we were hoping to hear. The only other candidate to mention housing was John Choi, but he only spoke about the need to produce more diverse housing that included workforce, senior and affordable housing. He, disappointingly, did not mention the need to preserve existing affordable housing. There were some differences between candidates regarding support of the proposed city sales tax increase, also on the March 5 ballot. CES is strongly opposed to this measure as it is a regressive tax that unfairly and disproportionately impacts low income and working people. The sales tax proposal came about after heavy lobbying from the real estate industry which resulted in the city abandoning an original proposal that would have increased the tax on real estate sales and substituted it with the half-cent sales tax hike plan. All the candidates stated their opposition to the sales tax increase, with Szabo and Mitch O’Farrell calling it a regressive tax that hits the lowest income residents the hardest, with the exception of John Choi. Choi said he supported the sales tax increase as a way to save jobs. 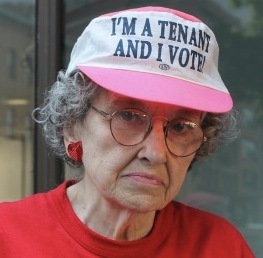 CES encourages voters to urge these candidates to address tenants’ rights and affordable housing issues. After all, the City of Los Angeles is a city of renters — more than 60% of its residents are tenants. One would hope that these candidates will tell voters where they stand on issues which directly affect the majority of Angelinos. For voters of the 13th Council District this chance is coming up next week. Next Tuesday, January 29th, at 6:30 PM, LA Voice PICO, a CES ally, is hosting a City Council District 13 Candidate Forum at the Church of the Blessed Sacrament, 6657 Sunset Blvd., Hollywood, CA 90028. Affordable housing is a primary issue they will address. Thanks for this great info! I live in District 14 (Boyle Heights) but support the struggle for affordable housing and spatial equality for Los Angeles’ most vulnerable. I’ll stay tuned? BTW, have you written any articles or opinions about the mayoral candidates?